Closet confession time: despite being a former obsessive premium denim collector, I have never owned a denim jacket in my life. Not even in the 90s when denim jackets were de rigeur. This light denim shirt is, of course, not a jacket, but I'm going to go out on a limb and call it "jacket-like." I have a feeling I'll be living in it this Spring/Summer... it seriously goes with everything! yaaay I love adding denim to my spring looks! I especially like how you belted it over the maxi!! Awesome outfit! 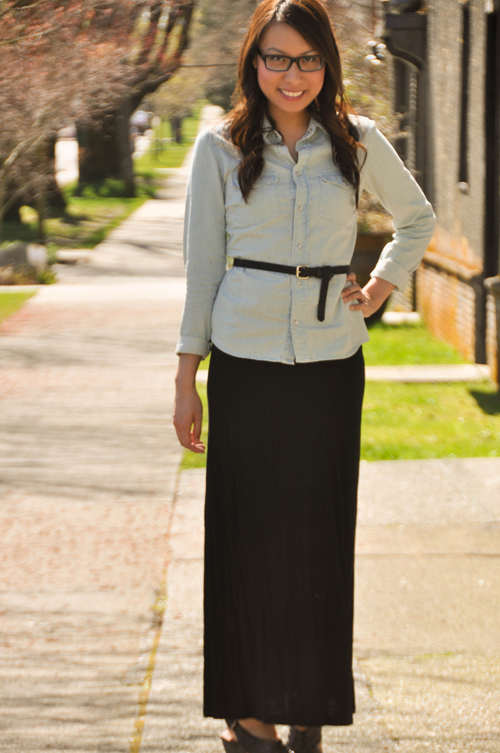 Love the light denim top with that maxi skirt, so chic! Yeah, I prefer the lighter denim colour too... it makes it look less "jean-y", if that makes sense! That looks really great! I have a black maxi skirt that I've been looking for styling tips for and the light denim with a belt is perfect. I'm the same way, I've never owned a denim jacket either! I see how versatile they are though, and I'll keep my eyes peeled for one. You look great! Love this outfit. Seeing them on so many people has helped me realize their versatility too! I love this outfit! So cute :) and the shoes looks great with the skirt. The pictures are beautiful! I'm looking for a chambray top. I saw this one from Aritzia... but I couldn't fork over the $90 for it. I'm going to Asia soon, I'm hoping I'll find something there ;) You're looking gorgeous as always! I'm surprised I still haven't hopped into you anywhere! I know... kind of pricey for a denim shirt but it seriously is the one I've been searching for for months. I hope you find one in Asia!! A good denim piece can be really hard to find - but the good news is, once you have a good one, it lasts forever! No joke; there is a denim jacket in my family that belonged to my cousin, then me, then my mom and is now worn regularly by my brother :) I recently foundmy perfect denim shirt and it looks like you found yours! I love how it looks with your maxi - I hadn't thought of that combination, but now I have to try it! This is so cute! I love that denim shirt! omg, had to comment on those darling glasses too. you're just so chic! A casual look I can dig! 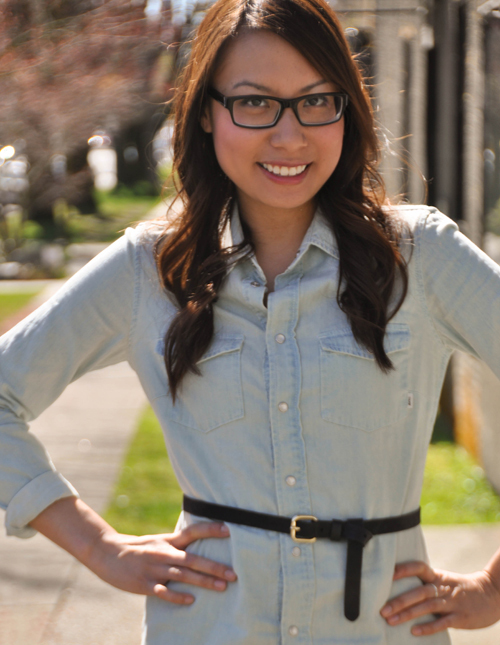 Love the denim paired with the maxi and you look so cute in those glasses! Check my blog and if you like follow me on bloglovin and google friend connect. kisses. haha I love denim too!! You look perfect, love the shirt. This is such a great look! I have been wearing my chambray shirt every chance I get and this just inspires me to keep wearing it haha. Love the pairing of these items together!